Where California gubernatorial candidates John Cox and Gavin Newsom stand on the top issues in the state | We Stand With Seniors...Will You? 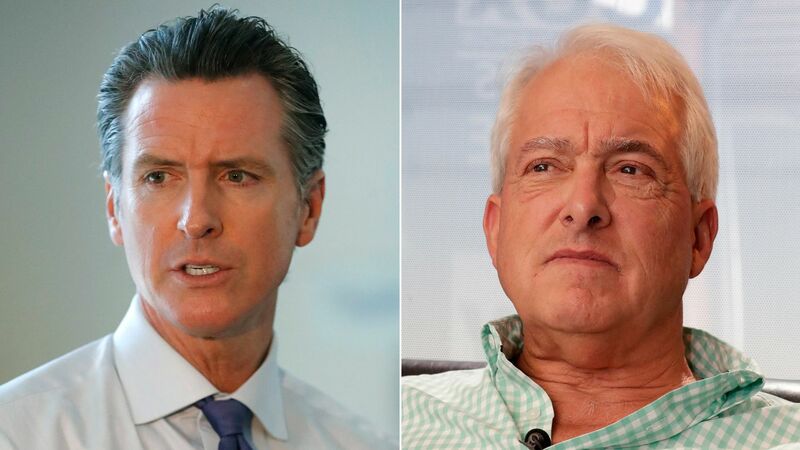 Welcome to your guide to the key policy positions of Republican John Cox and Democrat Gavin Newsom, the candidates facing off in California’s race for governor. Here’s where they stand on the issues. Businessman John Cox, Republican: Cox is a proponent of vouchers for low-income students to allow families to send their children to charter or private schools. He has called for a full investigative review of the state school system to find and fix inefficiencies. Cox has also blasted the cost of higher education in the state and has said cost-cutting measures should include looking at professors’ course loads to ensure colleges and universities are getting the most out of their employees. Rather than spending on education, Cox has said, the next governor should work to make California more affordable, which would allow families to pay for preschool and child care of their choosing. Lt. Gov. Gavin Newsom, Democrat: Newsom, who has made education a primary plank of his campaign platform, has emphasized a promise to work toward universal preschool in the state and wants a greater focus on investing in early childhood education and care for the first three years of a child’s life. He also wants to launch college savings accounts for all incoming kindergarten students in the state. Newsom would also guarantee two free years of community college tuition for California students and says he would work toward reducing the cost of higher education to relieve student debt. Cox: Cox is opposed to implementing a state-run single-payer healthcare system. He has mockingly suggested that the state could also provide “single-payer food and single-payer housing” for everyone. “I want to break up the healthcare corporate monopolies, make insurance companies compete and turn patients into consumers with power over their healthcare dollars,” Cox said. Newsom: Achieving universal healthcare in California has been a central part of Newsom’s campaign for governor. While Newsom was mayor of San Francisco, the city adopted a universal healthcare system in 2006 called Healthy San Francisco. At its peak, it provided affordable care to more than 70,000 uninsured residents in the city. He has promised to pursue a universal healthcare system if he’s elected governor but has not outlined a clear plan to fund such a program. In 2017, Newsom endorsed legislation by state Sen. Ricardo Lara (D-Bell Gardens) and now-Senate President Pro Tem Toni Atkins (D-San Diego), Senate Bill 562, that sought to implement a state-sponsored single-payer healthcare program. The legislation was shelved in the Assembly over concerns about the cost and the lack of a comprehensive plan for how to pay for and implement such a massive new government program. A legislative analysis estimated the cost to be $400 billion a year. But while his support for SB 562 was enthusiastic, it was also nuanced. Newsom was endorsed by the California Nurses Assn., the most vocal backer of the bill, but acknowledged there were some “open-ended” issues with the legislation. He has also voiced support for an effort by a coalition of labor unions, community health organizations and immigrant rights groups to steer the healthcare debate awayfrom SB 562. Cox: Cox, who owns a real estate investment and property management company, has a goal for developers to build 3 million new homes over the next decade. He has said the state needs to reduce regulations on builders, including replacing its primary environmental law governing development, the California Environmental Quality Act, with a less comprehensive measure. Cox also wants to allow Californians to be able to take the property tax benefits they receive under Proposition 13 with them when they move. He is against Proposition 10, which would repeal the Costa-Hawkins Rental Housing Act, a state law that prohibits cities and counties from imposing most new forms of rent control, including on single-family homes or apartments built after 1995. If the initiative passes, local governments would be free to put any restrictions on rents that they choose. On homelessness, Cox believes the state should rely more heavily on nonprofits and other private providers for assistance. Newsom: Newsom wants developers to build 3.5 million homes from when he takes office through 2025, which would be an unprecedented building boom compared with modern California history. He wants a fivefold increase in a state tax credit to finance low-income housing, bringing the state budget cost to $500 million a year. And Newsom supports eliminating regulations that he contends make it difficult for developers to produce middle-income homes. Newsom is against Proposition 10 and believes that the Costa-Hawkins law should be changed to add more renter protections. On homelessness, Newsom has said he would appoint a cabinet-level homelessness czar who would be responsible for ensuring that the state’s housing, criminal justice, healthcare and welfare departments work together on the issue. Cox: Cox has been steadfast in his opposition to California’s immigration policies. If elected governor, he has promised to rid the state of the so-called sanctuary law, which limits cooperation between state and local law enforcement and federal immigration officials. He supports a border wall. Shortly after the Trump administration sued California over its immigration laws, Cox released a minute-long radio ad seeking to tie sanctuary policies to the death of Kate Steinle, a young woman who was killed in San Francisco in July 2015. If elected, Cox has said, he would implement a “smart immigration” policy “to fill specific worker shortages instead of competing with Americans for jobs,” according to his campaign website. Newsom: Newsom is a strong supporter of California’s sanctuary state law, which was approved by state legislators and signed into law by Gov. Jerry Brown in 2017. As San Francisco mayor, Newsom presided over a city with sanctuary policies. He has often taken to Twitter to condemn Trump’s immigration policies, slamming the president’s plan to build a wall at the U.S.-Mexico border. “We cannot let this small, scared bully hurt our economy and turn ICE into his own personal army of hate,” Newsom said in a March 13 tweet. Cox: If elected, Cox said he would prioritize increasing educational opportunities— including expanding science, technology, engineering and math, or STEM, programs in schools and career tech education — and would work to boost training and educational offerings at the community college level. He supports broadening the earned income tax credit for those out of work by expanding eligibility for working adults and by issuing periodic refunds instead of a lump-sum payment. Newsom also has proposed a “sector-by-sector” system of portable benefits that gig economy workers can take from job to job. Cox: If elected, Cox said he would address the state’s wildfires by expediting “grants to local governments and nonprofits that can and will take immediate action in our most fire-prone and vulnerable areas.” He would also support urgency legislation to assist with brush- and tree-clearing efforts. Newsom: In addition to supporting fire mitigation actions such as clearing brush and dead trees, Newsom has said that fire risk should be discussed in the urban planning process. He told The Times that the only long-term solution to addressing wildfires and other natural disasters is to combat greenhouse gas emissions to fight the effects of climate change. Cox: Cox said he will implement a master plan on aging if elected. The Republican said he would work to increase access to and drive down costs for healthcare, and to address high housing costs to increase affordable housing options for seniors. He would also partner with the state attorney general and legislators to protect seniors from fraud and other crimes directed at seniors. The Republican has said he would not touch Proposition 13, the landmark 1978 ballot measure that limited property tax increases. He has also said he would immediately work to quadruple the renter’s tax credit, which is a small state tax subsidy for lower-income tenants. Newsom has also said he would consider lowering the state income tax rate for the middle class and extending the sales tax to services. Cox: Cox joined the California Republican Party and top Republicans including House Majority Leader Kevin McCarthy of Bakersfield in donating hundreds of thousands of dollars to help qualify Proposition 6, a ballot measure that would repeal the state’s increased gas tax and vehicle fees. Democratic leaders, including Brown and Newsom, say the levies are needed to pay for road and highway repairs. Cox is now an honorary chairman of the Proposition 6 campaign. Cox has also turned his focus to the state Department of Motor Vehicles, calling for an audit of the agency and for the department’s director to step down following revelations about hours-long wait lines and faulty voter registrations. Department officials reported in September that more than 23,000 voters were registered to vote incorrectly by the DMV, including some who were assigned the wrong political party preference. He also has been a vocal opponent of high-speed rail and launched an ad ahead of the primary criticizing a onetime opponent, Democrat Antonio Villaraigosa, for his support of the project. He has said he would work to kill it. He opposes the state’s delta water tunnels project as well. Newsom: Like other Democrats, Newsom supports the state’s increased gas tax and vehicle fees and is opposed to Proposition 6. Though Newsom has been accused of flip-flopping on the bullet train, he has said he wants to keep the project going. Newsom told The Times last month that he will concentrate on completing a high-speed rail line from the San Joaquin Valley to the San Francisco Bay Area. The southern half of the project, from the valley into Los Angeles, would be delayed until the initial line proves to be financially feasible and can attract more money from taxpayers or private investors. On other infrastructure projects, the lieutenant governor has said he strongly backed the $7.5-billion water bond approved by voters in 2014, including $2.7 billion for water storage. Times staff members Liam Dillon, Melanie Mason, Patrick McGreevy, Seema Mehta, George Skelton, Ralph Vartabedian and Allison Wisk contributed to this report.